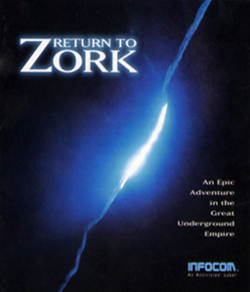 Return to Zork was the twelfth game set in the Zork universe and the sixth game in the main Zork series. A sweepstakes winner on holiday in the Valley of the Sparrows must put an end to the powers that have destroyed the land. Return to Zork is now supported by ScummVM, a program designed to let 2D adventure games run on multiple platforms. With ScummVM, Return to Zork now runs on modern versions of windows, as well as Linux, Mac OS X, and many consoles such as Dreamcast, Wii, PlayStation 2, and PlayStation Portable. For a complete list of platforms supported by ScummVM, see here.